We are conducting a Pilot Study to assess the acceptability and feasibility of providing rapid, point-of-care testing for hepatitis C in community clinics. There are now new treatments for hepatitis C that cure over 90% of individuals with simple, effective treatment that involves 1 pill a day for 8 to 12 weeks. But to get access to these treatments we need to get everyone tested and diagnosed first. 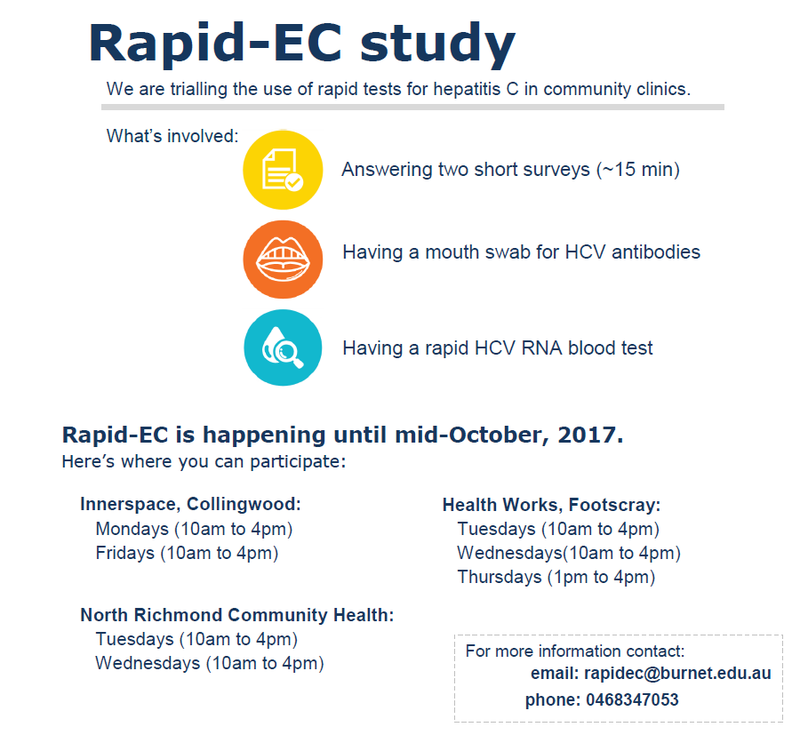 Rapid EC is trialling new rapid hepatitis C tests, which can give you a result on the same day and where everything is done in the health centre – rather than having to wait for a laboratory blood test. We think that these new tests may help reduce barriers to testing by speeding up the time to get a result and reducing the time to starting treatment. It might also mean reducing the need for a blood test for some people who are hepatitis C negative. This pilot is really important to help inform better service delivery for hepatitis C care and increase access to testing and treatment. · If you are positive - you will have confirmatory testing and we will link you in with our hepatitis nurse and GP to get you onto treatment. We're really excited by this project and appreciate the efforts of all our partners, especially at each of these three sites, to get it underway! For more information contact Bridget Williams at rapidec@burnet.edu.au or by phone on 0468347053.